Mount Everest - everything we need to know!? Re: Mount Everest - everything we need to know!? Get a pack where you can also tie a lot at the bottom and top and maybe sides. I know that most of the stuff should be inside, but it's no use having your mattresses inside and take away all the space and weight balance. Also think about how many times you actually need to haul 90+liters of gear, if needed you mostly can get by with one uncomfortable day with stuff on the outside on a much smaller (and lighter) pack. That's very worrying....I knew a lot had to be carried on Denali but an 80 to 90 ltr pack....and a sled! I was hoping to climb Denali in May/June...I'm 5ft 3 and weigh about 100 pounds. Am I being unrealistic?? that pack sounds bigger than I am! I have the Arc'Teryx Bora 95 pack and works great. I have a tendency to bring too much stuff but just my sleeping bag (a -28c) takes about 25 liters of space, so the space is definitely needed. The support of this pack is amazing, even if it's a little bit heavy, you don't feel it. And with the compression straps, you can reduce the volume to a 65l pack if needed and the pack will only be 1 kg more than a 65l pack. And if you go winter camping or ski touring like I do, you will definitely love the extra space of the 95l pack. i've got a quick add on question.. what do you usually or what do you eat for breakfast, lunch, and dinner?? I guess this goes out to ron and harry who have been on everest.. but feel free anyone else to add food stuff from other expeditions. though this belongs in a separate Everything we need to know about Denali-topic, I'll try to give some advice. 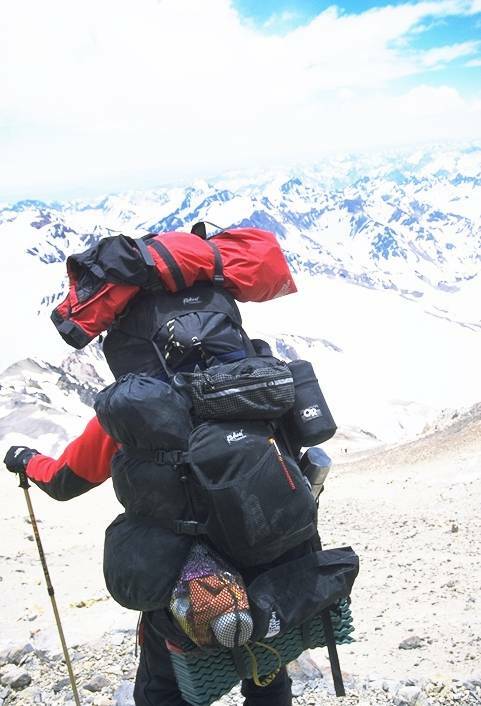 Denali is very tough as you have to carry everything yourself. It is the only mountain I actually went to the gym for beforehand to train my lower back muscles, shoulders and legs. You need very strong muscles to be able to drag a full sled uphill. - A team should divide the loads according to bodyweight. If you are travelling with a 200pound companion, (s)he should carry roughly up to twice as much as you do. This is only fair as you will probably only eat half as much, your clothes and sleeping bag are smaller/lighter etc. - Marian who climbed with Ron and me to the summit last year was maybe only 20pounds heavier than you and 2 inches taller and she went right for the summit (we all got there in 11 days), so if you train hard you should be able to make it as well. 5ft3 & 100pounds? And you fit Tyra's bra? Are you married yet? Up to ABC eveything is taken care of: the cooks prepare all meals and usually they are very good. Higher up I stick to freezedrieds with loads of sweets, chocolate and anything that tastes good while giving energy. I liked the proteine shakes as well as they gave me energy while rehydrating. For dinner I ate AdventureFood and Mountainhouse meals: chicken, mashed potato, pasta etc. Hot cereal with nuts for breakfast, very hard to get down at altitude actually, but loads of energy (and again rehydration). Did not do any lunch, just loads of snacks, GU gels, energy drinks etc. all day long. Darn, can't wait to get back! Well, I can only say that even though I lack the experience to go to Mt. Everest at this point I hope I make it there someday to try it out.. Every time I read about Everest or watch a movie or hear something I get this tingle inside and I curse myself for not starting with mountaineering sooner. Actually my girlfriend rather see that I go to Everest then Elbrus but that's basically just because a workmate died on Elbrus. I actually think I will go for a larger pack. After all, backpacks are extremely expensive here in Sweden. The Bora 95 costs US $850 or 650 Euro. Since I'm not made out of money I will probably only buy one pack and then use it until it's trashed. And before anyone says anything about buying it online from the US... I've already checked. It will cost me approx $450 and with shipping another $80. Then to that is the famous toll and VAT, bringing the final cost up to $830 so basically I won't gain anything on buying the pack there since all companies must fill out the value of the package. *spits on the ground* Some people have too much money m8! How much do they cost down in Holland at your store? I feel sorry for you now... May one be even more nosy and ask how much you paid for your expedition? I thought that everything here was expensive! But 800$ and US for that matters! I just saw a Bora 95 2003 on sale at 275$US (350$CAN) including all taxes. I might be planning a ski trip to canada this season...ive been in Quebec a few times already...very nice....i like the girls say "olala"
Whan is the next Ukatak race? Hey Ron, Harry and Buddha! The next Ukatak raid is from February 10 to the 18 from Ottawa to Mont-Tremblant, a distance of over 400 km. We can make an international team if you can fork the inscription fee of 1900 euros. Ron, we could get sponsored by The North Face, that could be pretty cool! I've got a place in Mont-Tremblant so we can crash after the raid, but you would have to be civilized, my wife will be there. Sounds like fin but for me it's a little bit too soon on. Me and my girlfriend are expecting our baby to be born in the middle of January. I don't think she's like me to head away from home that soon after. Now, for the competition in 2006 I would surely consider it. Maybe an international team then?